Binti has now been at Oomza University for a year, but she is feeling a strong pull to go back to her people and go on the pilgrimage that is usual for women in her tribe. She decides to make the trip and to bring her friend Okwu with her. If you read the first book, you know that Binti was the first of the Himba people to travel across space to attend Oomza Uni, but she did it by sneaking away from her family. Returning means that she has to face the loved ones that she abandoned. 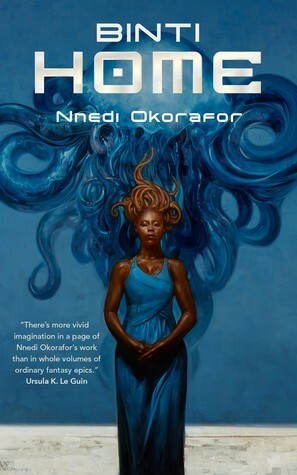 As if that weren't enough, she's returning with Okwu, a Meduse (that's Okwu behind her on the cover,) and they are considered enemies of humans. Plus now Binti is part Meduse too, which she cannot hide since her hair has turned into tentacles. Awkward. Although considerably longer than the first book - 162 pages compared to 90 - it's still very short, and again I was amazed at the level of imagination and detail that Okorafor manages to cram into so few words. One example of that from this book related to a group of people who have a really unusual way of communicating (and one that is completely misunderstood by outsiders.) It was very creative and it - along with the very alien form of Okwu - all reminded me a bit of the movie Arrival, in terms of how different and unexpected it all was. I also really love the character development, and the changing nature of Binti's relationships with her family members. In the course of this novella she learns some information about herself and her ancestry that challenges her identity, which is already in flux given the whole Meduse-tentacle-hair situation. Although her world is very different from ours, she is completely relatable and I completely sympathized with her problems, some of which are comparable to typical human ones. During this story she witnessed a phenomenon called the Night Masquerade, which just so happens to also be the title of the third and final book in the series, which was just released. I can't wait to find out what that's all about, so I'm definitely planning to read it!